Android (s goog) has raced ahead of iOS (s aapl) in smartphone share but it continues to fall behind in usage and engagement in the U.S. 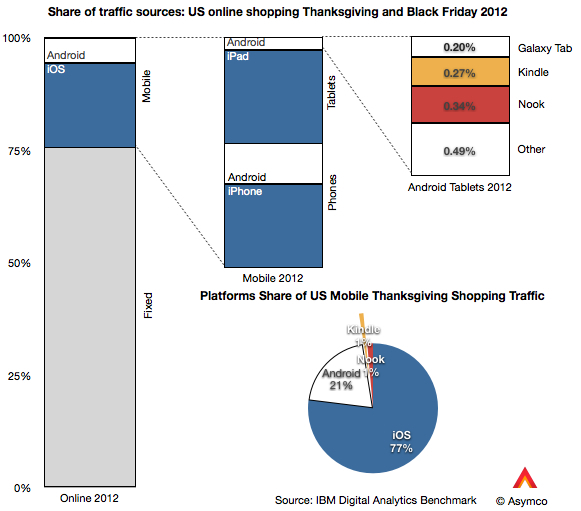 The latest data from IBM (s ibm) on Black Friday shopping traffic underscores just how much iOS outperforms Android. Asymco has some good charts that highlight the engagement gap. This is a pattern than has been in place over the last few years. But now that Android is now the top dog on smartphones marketshare-wise and is eating into the iPad’s lead thanks to the Kindle Fire (s amzn), Nook (s bks) and other Android tablets, why is iOS still so dominant? One thought is that Android users are more apt to want things for free, so they’re not as likely to shop for things on their devices. We’ve seen a gap in how Android and iOS users are willing to pay for apps — Android users prefer free apps — but that difference is going down over time. Some Android users are just graduating up from a feature phone and really don’t understand all they can do with their device. Considering the declining number of feature phone options, it’s possible that people are graduating to cheap Android devices, but just still talk and text on them, something Daring Fireball’s John Gruber mentioned before. Tim Windsor from Digitally Speaking goes a step further, saying that most iOS buyers are specifically buying their devices for the features they can access, while most Android users are just buying what’s available to them. Most, he believes, aren’t interested in serious computing power. Jason Grisby of Cloud Four recently wrote that the gap doesn’t exist when looking at web traffic over cellular. It’s only when you examine iOS and Android traffic over Wi-Fi that a usage gap emerges. He believes that Android users might not be aware of the availability of Wi-Fi networks through their device or are in lower income brackets and have less access to Wi-Fi networks. Some people believe there is no gap at the high end when looking top Android devices. The problem is with cheaper and older Android devices, which don’t provide as good an experience or are saddled with older versions of Android, which are worse at browsing. It is true there are more cheap Android phones options available, so that might contribute to some of the gap. And a majority of Android users are still on devices running Android 2.0x. Apple users are more likely to use apps, which can provide a better user experience. Android users who turn to a browser may not find it as inviting or engaging. It’s also possible that shopping data is not an accurate proxy for engagement. NetMarketShare earlier this year said, however, also came up with general browsing data that showed iOS devices have 65 percent of mobile traffic compared to 20 percent for Android. To be clear, the data we’re looking at is from the U.S. only, and it’s based primarily on shopping traffic. My theory is that there are people who walk into a cellular store, see only a handful of feature phones available and a salesperson who is heavily pushing Android devices. If they want to walk out with a new phone, it’s likely going to be an Android unless they came in already looking for an iPhone. Those people may not be savvy now, but they will get more experienced over time. What are your theories on this Android paradox? 1) People are being put off by the actual mechanics of spending money through the fragmented choice of Android browsers. In some cases the shopping sites might not be properly tested with the browsers. 2) The figures are just plain wrong. Not so fragmented any more. I believe > 70% of the huge android base is in 2 versions of the os. Much better nowadays. You left out one obvious one: iOS might actually be easier to use than Android and the features in question thus more “discoverable.” I know I’ve had to help out more than one relative who went to the store to buy an iPhone, got strong-armed into buying a Galaxy SIII instead, and have no idea how to make the thing work. … And those who were Dancing were called insane by those who could not hear the Music. I think the question is: Why are engaged users more likely to choose iOS over Android. That question my dearest friend is complete shenanigans. A LOT of people (myself included) who like to be perpetually connected to the internet choose Android. and Simply because we have OPTIONS. unlike and iOS user who has to rely on safari with no flash to boot. When you don’t care about your phone (and many mobile phone users don’t) and just want a phone you are much more likely to be offered an Android phone than an iPhone. This is not that the low end Android phone is bad. This is just the user buy it as a phone, and so don’t use the advenced feature it doesn’t care about. This point is usually countered by the market share of new high end Android phone that start to show impressive number. This is true but it omit that historically most high end phone where iPhone and that many of theses devices are still arround. This data was collected in the US market only, proper perspective will be to consider most major markets. I have seen an article on phdguy website http://www.phdguy.com about future of web and death of google. My theory is based on how much people use their phones. Where I work we are not allowed to use our mobile phones, except in an emergency. In reality, if you walk around here, you will always notice at least 2 people who are using their phones. 90% of the time it will be an iPhone, not because they’re better phones but purely because the people who own them can’t keep off of them. They don’t seem to be able to go more than 20 minutes without checking FB or emails or something, but in spite of the fact that if caught, they may end up on disciplinary. So, In my opinion, the reason ios has higher Web traffic: obsession with mobile devices. Desktop browsing is far superior when looking for a lot of information. This articulates what I started to suspect just after listing and selling my Google Nexus 7 on Craig’s List (a great product, yet my third Android tablet bought and sold within 4 months of purchase). I consider myself platform agnostic. But there IS a difference between the iOS and Android user experience. I don’t see Android matching it anytime soon. Reminds me of Symbian… Lots of units moved, few users knew they had a smartphone or used as such. You can’t even buy a dumb feature phone now, all those users are migrating to Android. Would be interesting to know Android usage less the featurephone migrators. Do you have the data to support your opinion? wow, that is a ridiculous statement. Wouldn’t it have been more appropriate to say 2.x instead of 2.0. I for one prefer my android over my iOS device. Only use the crapple for email. About the only thing it does well. There’s no selection about trusting this data. It could be that the Android browsers aren’t revealing that they are actually Android. There’s absolutely no info about 3G/4G computers on the graphs, so it makes me very suspicious. it is possible, but i don’t think so, it is very easy to determine what browser, and operating system someone is running on by requesting a web site. I am on my 3rd iPhone. I have had Windows Phone 7, Webos, and a few different higher end android phones, most recently the Galaxy S III. I keep going back to my iPhone, BUT what i do notice, is that when i have an android phone, even a higher end android phone like the Galaxy S III, i don’t use it for anything except for calls, texts, and occasionally browsing the web. I just don’t feel compelled to use my phone as much. I feel the experience is sub par, and i tend to experience issues along the way. this is just my opinion. Whenever i have an android phone, and i need to do something dealing with the web i always say to myself “Ill just do it at home, i don’t fell like messing with it”, but i don’t have the same issue with an iPhone. I didn’t have the same exact issue with Windows Phone, but the selection of apps kept me from doing as much as I did on my iPhone. I do really enjoy the Windows Phone experience. it sounds like you’re just mad that i don’t care for android all that much. I have given Android many chances. I most recently had a Galaxy S 3, I also have had an HTC MyTouch, a Nexus S 4G, and an Evo 4g. I am not saying that they are bad phones, but every time I have owned an Android phone, I use it far less than i do when I have an iPhone, a Windows Phone, and even my webos phones. I guarantee i have owned more phones than you have, and am more qualified than you. I have had an iPhone 4s 3 times, the android phones listed above, an HTC HD7, Lumia 800, HTC Arrive, Lumia 710, every webos phone that was ever produced, blackberrys, and the list goes on. I will be switching to a Lumia 920 in a few months. Don’t attack me because you’re mad, fanboy. Tethering works on Android. iOS users can’t tell which apps are wasting their data like droid users can. A lot of mobile sites are really only iOS sites. (see Facebook droidfooding for example). This site also drags on every droid browser except opera. Siri results are shopping oriented. Read Woz’s comments about Siri before and after Apple. Personally, I use my droid for its utility. Maps, camera, SMS, music, flashlight, calculator, etc. The only time I use it for shopping is to check if I can get something significantly cheaper online. I use my iOS device the same way that you do. No problems at all. Camera, SMS (iMessage). Music (Spotify), flashlight, calculator etc. But I admit I use Google maps in the browser until a better solution appears. Spotify is easier / cooler on Android. No ‘hide’ button. Drag from off screen to access menu,. Larger screen makes all apps cooler. Capacitive ‘menu’ and ‘back’ buttons along with drag from off screen commands make the UI of any app less cluttered. The new camera menu you just hold your finger anywhere and the menu pops up in a circle around your finger. I use 2 half screen Google plus widgets, a full screen Gmail widget and NOVA launcher to customize the UX so it is exactly what I want. Want to experiences IOS on Android? just don’t use any cool android features. Tethering works on ios too. It may, but it doesn’t matter because it costs too much. Nobody uses it. I have unlimited data with tethering on TMo for $30/mo. It costs $20/mo on AT&T just for the privilege of tethering alone. The data costs much more and it’s capped. iPhone users have budgets too. It pains me to see my friends with iphones paying extra for things I get free. I play bad piggies for free. My friend has an iphone. It will cost him a dollar. Android is so screwed. Clearly Android users hate not just their devices but themselves too. Thanks for your insightful contribution to the discussion. Obviously, ios user had no life and stuck to their devices on black Friday. Android users? Went out to experience life! dont you mean iOS users were out and on their phone, while andriod users were on their desktops at home. Then that’s a failure of the OS, shouldn’t it be just as enjoyable on that device? How does that explain the discrepancy? Pocket is on ios as well. It comes down to the controversial argument of iOS vs Android. And the statistics show who’s the obvious winner. We can safely assume, with the usage statistics, that a person with both an Android and iOS device will choose the iOS device for actual use. Yes, that Android device may not be a high-end device. But the gap is so big, I believe there must be something iOS is doing right that Android isn’t. iOS lets users focus on their content they care about and gets everything out of the way. No widgets, no toggle switches for key settings, no this, no that. That’s sounds like a bad thing. When you actually get down to using the device, 90% of the time you are using apps. So what does the iOS Homescreen let you do? Lets you view all of your apps and launch them. Together with the overall intuitiveness and consistency of the user interface in iOS, the operating system just disappears between the user and the user’s content, letting users totally immerse in their content. So in the end, iOS wins on the usability segment. No matter how many features it doesn’t have, that’s what matters. Also it seems that while many Android users claim they love android for the powerful hardware, very few of them actually even use/need that power. This just leaves them doing the same thing as iOS users, just with a slightly less clean experience + widgets. In the end with or without the powerful processors and graphics, they are in the same boat as any iOS user. Without a good user experience and good applications, the hardware is just excess battery drain. It seems that ifans will forever be envious of android devices and their widgets. Widgets are actually one of the reasons I went android. Was going to buy an iphone 4 at first, I just like the idea of having widgets. And yes, I do use my droid for browsing, but only if I’m not near a computer. It’s retarded to choose a small screen for browsing the net when you have a larger on right in front of you. Has anyone considered the impact of training resources on device usage? Apple offers setup services, free workshops, and in-depth one to one and group training through its retail stores, as well as further learning opportunities via phone (AppleCare) and Internet (apple.com). Apple Stores are only available in 15 countries around the world. iOS devices are being sold at hundreds of countries. All the stats reported in this post are USA only. Apple stores have the US covered twice over. And iOS is so easy to use there is no need for anyone to learn how to use it. Seriously, even a 5 year old kid can use it. Yup, to design that kind of ux need a lot of efforts. To copy and throw everything inside is very easy. My theory is that iOS is just that much more fun and easy to use. People gravitate toward these types of devices, and thus far Android (while powerful and certainly feature rich) is no the experience people want. I saw this over the long weekend here in the US. People grabbed for the iPads and iPhones… the Kindles and Android devices sat on shelves or tables as last-used devices, some collecting dust all weekend while iOS devices were actually fought for by kids and adults alike. I also saw laptop computers sitting idle in the mornings while iPads were out in full force as people drank their coffee and shopped sales. Android sells for many of the reasons already listed. It still not that awe inspiring experience that Apple provides. Only the blind Android techno geeks dont’ see this… the rest just open their eyes and it is obvious. Or it could be that iOS users force themselves to use their over priced devises to justify the premium they paid to get them. Its all yuck for me on iOS. Its so stale and static and navigation using single physical button is cumbersome and uninspiring. As far as I have seen no IFAD and I phony owners has suggested a single concrete feature that makes their experience on iOS easy. I can’t understand (I’m lying I know exactly why) one of the most obvious scenarios hasn’t been brought up by any of the major tech media. Google something like “what’s my user agent” on an Android device. When you get to the site if you aren’t already have your broswer request the desktop site. You don’t see any hint of Android in that UA string do you? That’s because the whole point is to hide that you are mobile so that you get the desktop site. Has anyone questioned how sites are determining when Android devices are hitting sites? Of course not. The iFans have started coming up with any ridiculous reason they can from poor user experience to price of handsets. Meanwhile in the real world I can hardly find anyone that actually wants to do anything complex on an iPhone and hardly see them in use in public anymore. I think you’re delusional if you think most Android users even know what “user agent” means, let alone cares what it means. I doubt this. I think more android users are PC junkies who refuse to go with the iOS because of how dumbed-down it is and were pushed away from Windows mobile by MS after they gave up on the enterprise and PC geeks to go after the same market apple markets to. I have my browser set to request the desktop sites and so do my wife and all three of my kids. I see no “iFans” coming up with these reasons, these are analysts. Many iOS browsers allow you to change the user agent string as well. Those aren’t being counted as iOS. it still shows that you are running on android. This quote is very telling for me. As an avid Android user, i never chose my Android over my notebook, but my boss, an avid iOS user, sometimes prefer to type an email on iPad even when his MacBook pro is just in front of him (literally). I cannot understand why he does that. But i see a lot of iOS users doing the same. So anecdotally, my guess would be: Android users just stick with their PCs when at home (presumably when they have Wi-Fi), whereas iOS users prefer the small screen, for some reason. I have seen exactly the same and I too wonder why they do it. My friends surf on the tiny 3.5″ screen and I almost always prefer the PC. I have core i7 PCs at home and work with 27″ screens and I’d be insane to use my relatively small 4.8″ Galaxy S3. The only time I use the phone is when I’m truly mobile. On my Transformer Prime, I use the desktop mode most of the time. I wonder what user agent that sends. I’d be interested in seeing whether that contributes, but I think not. I don’t think most users will know how to do that. Sounds about the same with me. My Verizon Nexus works great when I’m out and about – I’m grandfathered into unlimited data, 10 days in my billing cycle, I’ve used 6 GB, lots of Netflix, Youtube. At work, it’s all Windows desktops. At home, I’m on my big-screen Windows desktop, more than on my Nexus. Also, my home wifi is slower than LTE, so I don’t bother turning on wifi on my Nexus. I do lots of online shopping on desktops, hardly on my Nexus; I prefer the desktop big -screen for shopping. The apps I use the most are Gmail, Google Maps, and stock Android browser. I mostly use mobile websites since they work fine with me and I find apps mostly buggy, generally useless, so I hardly buy apps. This is exactly my thought. Even with a Google Nexus 7, I find myself reaching for my Dell XT3 tablet PC when I want to do anything that requires more than a few quick gestures. Even shopping, I can view 20 items at a time instead of 4. I only use my phone or tablet when using the notebook is inconvenient. As an Android user, I kind of feel that people that choose iOS know up front that there is cool stuff to do and buy from their mobile device. It started for me that way when I bought my iPod Touch a few years ago. What happened is that I got bored of just icons on a screen, talked to some IT friends that I have and bought a phone with Android, the Motorola Photon and now the Galaxy S3. I still have 2 iPod Touches and an Apple TV because I have content there but I now own 2 Google TV’s, 2 Android tablets and the GS3. I have pretty much switched my content and app buying from Apple to Google.